She is not our only baby bird growing up. 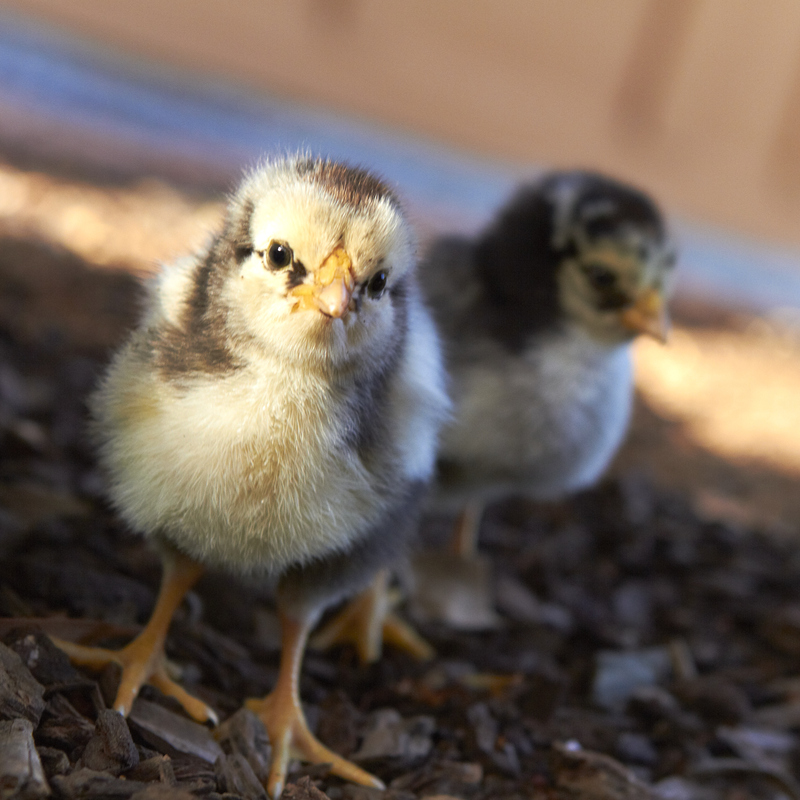 With the passing of Steve, “Bebe,” the chick in our banner and Facebook profile picture, who we watched hatch from an egg, is now our senior hen. She is a proficient layer, laying a large, light brown egg daily. 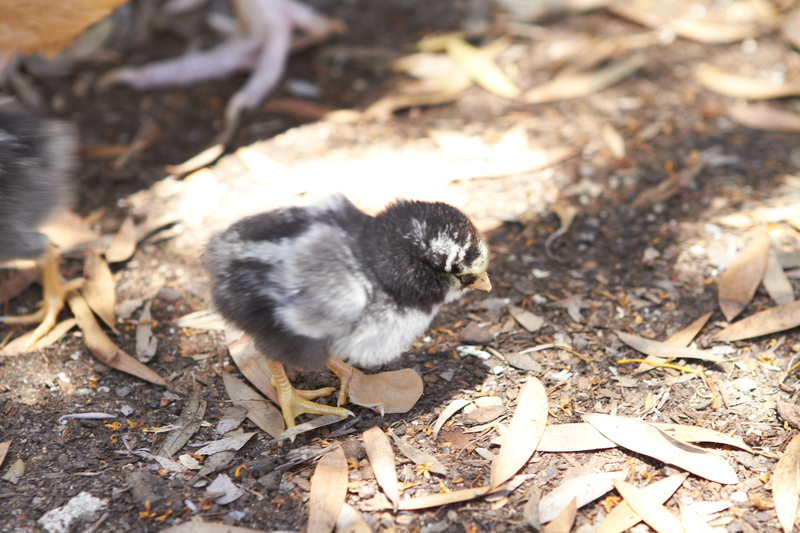 Although we don’t have any roosters, we were lucky to watch Bebe and her sibling hatch and grow. A few years ago my husband noticed that one of our hens, Butters, a sweet and social Buff Orpington, was broody. “Broody” hens sit on the eggs all day trying to hatch them. In the wild this is obviously a necessary characteristic in order for the eggs to survive. However, most laying hens have the trait of broodiness bred out of them as it can disincline them to lay more eggs. For the purposes of egg production they simply need to lay the egg and move on. And finally, one day in the spring, we had babies!! Two of the eggs hatched. Give me the meanest, grouchiest person, put newborn chicks in front of them and I guarantee they will just melt. There is nothing cuter. One chick was strong and healthy. Since the baby bird had black feathers, well black fuzz, Papa Bird kept the South Park references going and named the chick “Token.” The little one we called “Bebe.” Unfortunately, little Bebe was born with a club foot. Her foot curled in and didn’t open up properly. She couldn’t put weight on it or walk properly. I imagine that back in the old days, on a large farm, such a deformed chicken wouldn’t get the chance to survive. Then again, in modern, large scale egg production the chickens live in cages and aren’t really allowed to walk around. So who knows what they do. Papa Bird did a little research and decided to try to splint her foot. I was so proud of him and his All Creatures Great and Small skills. As I played nurse and lent extra hands, he experimented with various splints for Bebe. First he tried a little piece of cardboard and some medical tape. Unfortunately, Butters kept pecking at the white cardboard. We were worried she would hurt the poor baby’s foot. Eventually we found that what worked best was just a bandaid or two. Fortunately, after about a week her foot worked well, if a little smaller at first. Now you can’t even tell! Token, on the other hand, had a different problem. You see, he ended up being a “he” which is illegal in the City of San Diego! We took him to White Mountains Ranch later that year so he could enjoy the spoils of country life. Butters and the babies looking for bugs outside my bedroom. 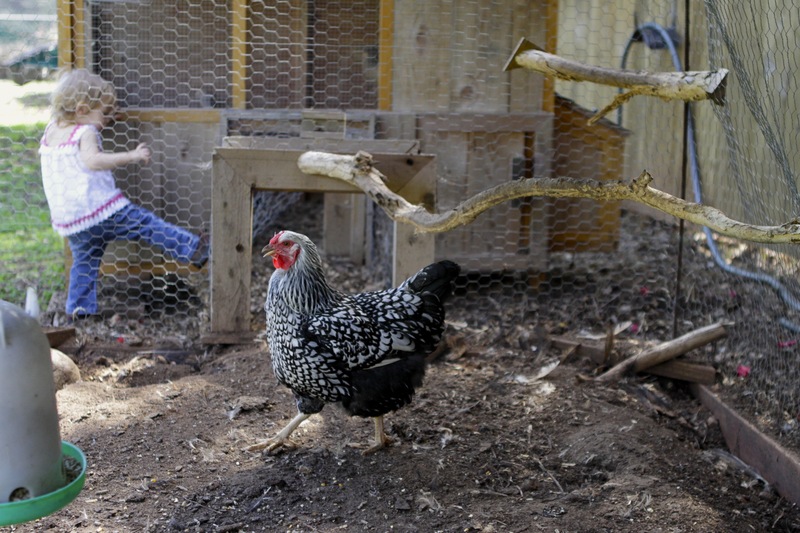 This entry was posted in Backyard Chickens, How To, Natural Remedies, Our Family, Urban Homesteading and tagged Backyard Chickens, bird's club foot, broody hen, chickens, eggs, hatching chickens, hatching eggs, homesteading, how to splint a club foot, Urban Homesteading. Bookmark the permalink. Oh I love it! I’ve been begging my husband to let us get chickens but he just won’t have it. Maybe when we don’t have a 90lb dog who might eat them? Danielle, I was actually the one that wasn’t sure about chickens. My husband was the one pushing. But now I am so glad! Thank you Mary! That means a lot, considering all of your animal experience! We used regular Band-Aids and only used the sticky part. You can use it on the top and bottom of the foot using the adhesive of the two Band-Aids together to separate toes. You can use white medical tape if you don’t have a mother hen around. The mother tends to peck at the white color on the chick’s foot if they see something on it. That’s why we used the Band-Aids. As far as getting it off I don’t remember really. I think they were fairly easy. If you soak them in water/or get wet it’ll be easier.